NOTE! Mountain Visions hosted one of the first Web sites to follow a mountaineering expedition with the "1995 Everest Challenge - The First Disabled Ascent. Tom Whittaker is planning another expedition to Mt. Everest in 1998. We will post the planning process and expedition progress during the next two years at this site. You can still access the pages on the 1995 Everest Challenge including new pictures accompanying the expedition log. The 1995 Everest Challenge was featured as part of the CBS Smithsonian Fantastic Journey with Dan Rather on August 10th,1996. The show contained a short segment of Tom's Everest story and his advocacy for people with disabilities. Recently, in the Spring of 1996, three more Everest Expeditions reported progress on the World Wide Web. On May 11th, 1996, a vicious storm caught climbers high on the mountain and tragically, ten climbers died. Dramatic rescues were also reported. 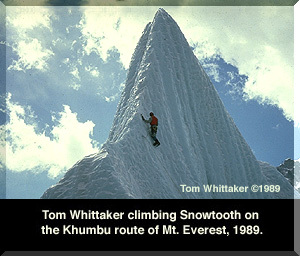 Tom Whittaker was caught in a similar storm on Mt. Everest in 1989. This story and a chronicle of Tom's involvement in Mt. Everest expeditions is covered in his article "Against All Odds." For full reports on the 1996 tragedy and/or climbing success and related topics, visit the following sites. Imax camera crew filming - Also reports about May 11th Tragedy. Quicktime VR panoramas from base camp and Khumbu Icefall. Everest Challenge has been selected to be one of the outposts for the CyberSurfari '96 treasure contest. Click on the globe to get more information.